Russian officials have expressed their sharp criticism towards the U.S. plans for the so-called "Prompt Global Strike" initiative. Are they justified? What does this "Prompt Global Strike" represent, how can it interfere with the Russian plans and how can it be opposed? The U.S. military adopted the concept of the Prompt Global Strike (PGS) during the 2000s. The basis of the idea is the ability to make a non-nuclear attack anywhere in the world within an hour after a decision is made to strike. How can we solve this problem? The first components of PGS, the most realistic in its execution, are conventional intercontinental ballistic missiles equipped with high-precision, non-nuclear warheads. The second component of PGS facilities can be strategic cruise missiles with hypersonic speeds. The third component of PGS is kinetic weapons, or “wands of the Lord,” which is the ironic nickname for this weapon, widely described in fiction but still not implemented in practice. The United States is not making the PGS targets a secret; they have been described in Pentagon statements. But who are the PGS facilities created for? First, they are mobile and stationary ballistic missile launchers, command centers and other nuclear facilities. Secondly, they are "facilities isolating military operations” – launchers of tactical missiles as well as antiaircraft missiles, obstructing the standard air-ground or air-sea operations. Thirdly, it is the terrorist infrastructure – in this case the use of PGS is not any different from the strikes made from unmanned aircrafts. China, North Korea and Iran are named as the owners of this infrastructure, and in the third paragraph it says that it is "international terrorism." At the same time, Russia has many facilities isolating military operations, as well as mobile missile launchers, and therefore it cannot be excluded from the list of possible PGS targets. It is clear that a similar attack is fraught with risks of nuclear escalation and full-scale retaliation against the United States. However, on the basis of this sole thesis, it is impossible to conclude that PGS does not threaten Russia. The biggest part of PGS is, of course, the ballistic missiles equipped with precision nonnuclear warheads. The idea was one of the first ones, and it was also one of the last ones to become the subject of skepticism. In fact, the non-nuclear ICBMs have a number of drawbacks. Mainly because all the systems of missile warning and missile defense information tools are detected as this type of objects (as well as warheads after their division). And if this does not matter during operations conducted as PGS against a third world country, as soon as it comes to a potential enemy such as Russia or even China, things get much worse. It does not say on the intercontinental missile which equipment it has, and, strictly speaking, during a the mass start of such missiles any country’s government has all the capabilities of organizing a retaliatory strike, i.e. of launching their missiles (already with the nuclear equipment), without waiting for the arrival of unexpected guests. From the point of view of the principles of nuclear strategy and international security in general, this is a very bad option, hence the reaction of the Russian Foreign Ministry. "If we are talking about existing ballistic carriers with conventional equipment, it is clearly the path to the escalation of the conflict with the hardest, in fact, apocalyptic consequences," said Deputy Foreign Minister Sergei Ryabkov. That is why the main focus of development of PGS facilities was redirected to the hypersonic aircraft. This topic is more complex in terms of its engineering and physical design and implementation process, however, the resulting facilities are more flexible, versatile and more promising. It is necessary to understand the capabilities of modern air defense systems. The Top Russian ADMS – S-300PMU-2 Favorit and S-400, are capable of striking targets moving at speeds of up to 2,800 and up to 4,500 meter per second, respectively. 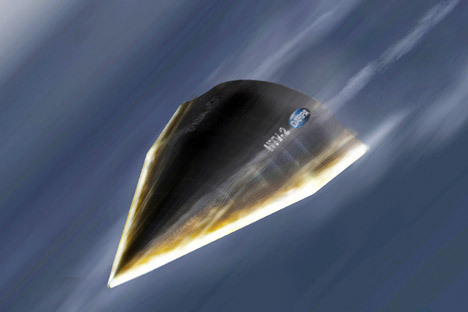 This is on a hypersonic level, however, the same prototype of Falcon HTV-2 attains a speed of up to 7,800 meter per second, which is comparable with speeds of military intercontinental missiles at the terminal stage of their trajectory. As for the facilities of the kinetic destruction, the question of their deployment and a creation of defense facilities against them cannot be solved tomorrow. In any case, the orbiting of such systems will trigger a new arms race, coupled with the creation of space-based weapons, and possibly a return to the orbital system of nuclear bombing, the first samples of which were tested in the late ‘60s and subsequently prohibited by the 1979 SALT 2 Treaty. In the conditions of reducing the threat of global nuclear war since 1991 and, at the same time, a distinct lowering of the threshold for using tactical nuclear weapons, the full deployment of PGS can significantly complicate the maintenance of strategic stability. This explains the sharp reaction of the Russian Foreign Ministry.